What’s So Great About A Programmable Thermostat? This entry was posted in HVAC and tagged Energy Savings, FAQs, Programmable Thermostats on July 16, 2015 by coolbreeze. If you have ever thought of the best way to control and easily adjust the temperature in your home while keeping your energy bills as low as possible, we advise you to choose a programmable thermostat. 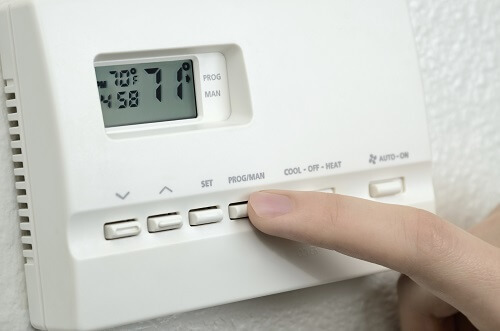 Read on to understand just what a programmable thermostat is as well as its benefits. Generally, a thermostat is a device that is installed to regulate the operation of mechanical or electronic heating and cooling systems with regards to the set temperature results. A programmable thermostat integrates new and innovative functionalities to adjust temperature settings automatically, and maintain the required room conditions at different times of the day or night or week. In other words, a programmable thermostat is thermostat that you can program with an innovative digital design. Some programmable thermostats even come in wireless formats, which enhance easier and more flexible installation and temperature control while maintaining similar functionalities as conventionally wired thermostats. Programmable thermostats differ from the older mechanical thermostats, most of which don’t have programmability and advanced temperature control functionalities. Installing a programmable thermostat is beneficial in a number of ways. First off, they are a lot more accurate than their analog or mechanical counterparts. Mechanical thermostats (manual turn dial) can be slightly off from what you think they’re set at which can in turn waste energy and increase your utility bill. Also, turn dial thermostats respond slowly to temperature changes, compared to programmable thermostats. What’s great about a programmable thermostat is that you can program it for times that no one will be home (work/school), for sleeping and when your family is away on vacation. When everyone’s away, this will allow your HVAC unit to not work as hard or come on as often to cool or heat your home, thus saving you money. You can set your unit to then come on a bit before you get home from work or vacation, ensuring that you have a comfortable return. 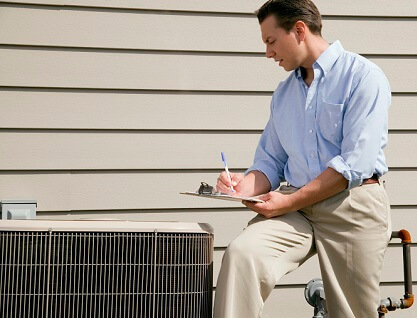 Heating and cooling is a major component of energy use in many homes and businesses. Installing a programmable thermostat will save you money as well as the earth’s resources. Cool Breeze Comfort Solutions is a leading expert in heating and cooling, as well as plumbing, air quality, water filtration and appliance repair. We can answer all of your questions and make sure you get the right thermostat for you and your family’s needs. Call Us Now For Thermostat Assistance, Repair Or Replacement! Subscribe to our blog and follow and like us on Facebook for more great articles on heating and air conditioning and more! 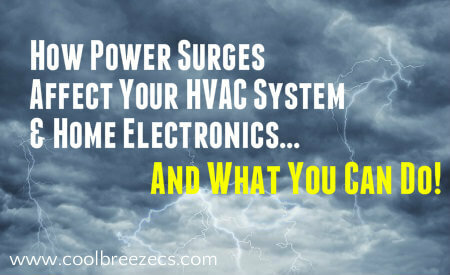 How Do Power Surges Affect Your HVAC System And Home Electronics? This entry was posted in HVAC and tagged Benefits, FAQs, Surge Protection on April 1, 2015 by coolbreeze. The number of high-tech electronic items and appliances for the average home has increased in the last several years. Years ago, surge protection was seen or considered useful only if you had a big-screen television setup at home. Today, electronic products and large appliances, including the home phone, dishwasher and also the HVAC system have a great amount of power going to them. Power surges could be caused by a variety of things from lightning strikes to power grid issues. These surges could be extremely harmful to your electronics, appliances and HVAC unit. In fact, even one power surge could cause irreversible damage to electronic systems and their sensitive components. Before, HVAC systems were primarily mechanical in there functioning, with very few electronic components. Things have changed, especially with newer and higher efficiency models. The issue with a power surge is that you don’t have a way to tell how much damage it will cause to your system if and when it happens. Large power surges could be very devastating, many times leading to immediate failure. In a majority of cases, power surge-damaged HVAC units have to be replaced and cannot be repaired. While some units may withstand a power surge and continue to work like before, there could be hidden damages. Over time, this hidden issue could compromise the unit’s efficiency and lead to premature failure. This is certainly not good news, especially with something that’s as vital and expensive as your HVAC system. While you cannot really do anything to prevent power surges from occurring, there are some things that could be done to safeguard your HVAC system and other valuable home electronics. It is recommended that you install an entire-home power surge protection for your HVAC at the primary breaker box to help protect your unit from damage. For other electronic systems, buying individual surge protectors and using those at every outlet is recommended. If You Have Additional Questions And/Or Are Interested In Protecting Your HVAC Investment, Call Us Now! Do I Need Home Surge Protection For My HVAC System? This entry was posted in HVAC and tagged Benefits, FAQs, Homeowner Tips, Surge Protection on February 26, 2015 by coolbreeze. At one time, home surge protection was only associated with computers or big-screen television sets. Now, as technology has become more sophisticated and our level of comfort has grown with it, we are surrounded by devices using printed circuit boards in our homes much more often. Our home phones and even our HVAC systems fall into this category now. 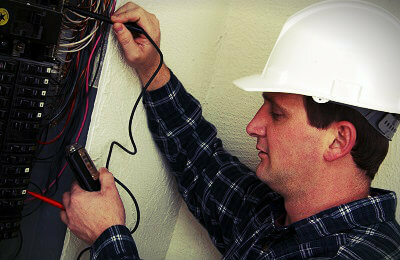 They can be vulnerable to a power surge caused by an issue with the power grid or a lightning strike. These surges can be devastating, since even a small surge has the potential to cause irreparable damage to sensitive electronic components. At one point HVAC systems had very few electronic parts, and were mostly mechanical in nature. Modern, higher efficiency systems are designed differently, though. The issue with newer models is that when a power surge hits, you have no way of determining how much damage one of them will do to your equipment. Large surges can cause immediate failure to your HVAC unit and extensive damage that is difficult to repair. In a number of cases, damage caused by a power surge means that the HVAC unit must be replaced, instead of being repaired. Even if your HVAC unit survives a power surge and appears to be working just fine, there may be hidden damage. Over time, this damage may lead to premature failure. This is not a result you want to see happen to an investment you have made in your HVAC system. Even though you cannot stop power surges from occurring, there are steps you can take to protect your HVAC system and other appliances in your home from becoming damaged. Have a whole-home surge protector installed at the main breaker box to prevent excess power from being a problem for items tied into the power line, rather than an outlet. Buy individual surge protectors and using them at each outlet where you have electronic equipment plugged in. We are your local heating and air conditioner experts in the Tucson, AZ area and we can assess your system to determine its level of protection. If you still have concerns about surge protection and your HVAC system, call Cool Breeze Comfort Solutions now!